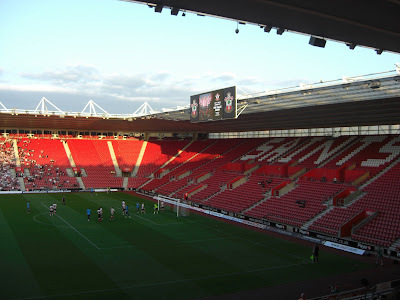 My forty-second stadium of 2011 was on Wednesday 27th July 2011 at St Mary's Stadium in Southampton, Hampshire. The match was Southampton vs. West Bromwich Albion in a friendly game. St Mary's Stadium is just over a mile from Southampton Central railway station. It has been home to Southampton since 2001 when they moved from their former stadium The Dell where they had resided for the preceding 103 years. The 32,689 all-seater stadium has more than twice the capacity of Southampton's former home and is more suited to the club's large fanbase. Even though Southampton have been outside of the top flight for most of the stadium's life, attendances have held up well. St Mary's is designed as a bowl with all stands of the same height. The four stands are the Itchen Stand on the east side, the Kingsland Stand on the west side, the Chapel Stand on the south side and the Northam Stand on the north side. The Northam Stand contains both away fans and the more vocal home fans which no doubt creates quite an atmosphere for big games. There were some crowd issues before the game as with this being a pre-season friendly with the stadium only 20% full, a lot of fans had assumed you would be able to pay on the gate. However, this was not the case, leading to very lengthy queues outside the ticket offices. Having just managed to get into the stadium in time for kick-off I watched the game from the Kingsland Stand. There are excellent views all round the ground and the bowl shape combined with the panels between the seats and the roof means the venue does a good job retaining the noise and atmosphere. This despite an attendance of just over 7,000 for this friendly. The game was a pre-season friendly between Championship side Southampton and Premier League side West Bromwich Albion. The first half was a goalless one with the home side coming closest of the two teams to breaking the deadlock. It was West Brom who took the lead 15 minutes after the restart after a howler from the Southampton goalkeeper. The Saints battled back and were rewarded for their efforts when they headed in a free-kick 70 minutes to level the scores. However, they fell behind again just a few minutes later as the visitors split their defence to slot home. Southampton continued to press and with five minutes to go scored another headed goal to even the score up at 2-2 which is how the game finished.